Something a little different for me, in that it is (a) black and white and (b) not textured! Mark and I had a photographic wander around Shoreditch in London’s East End on Sunday, specifically looking for street art by some of our favourite artists. Mark had previously seen and photographed this piece by Trans and FARKFK, but I hadn’t seen it before, so armed with our ‘graffiti hotspots’ map that I had created with a bit of research, we headed to this public car park entrance first. As I have recently downloaded a trial of Silver Efex Pro for black and white conversion, and have been LOVING using it, I have a “B&W head” on at the present time, but equally I feel that this style of processing really suits the urban subject matter. This one was processed using my old favourite Kodak TMAX 400, which I used to use a lot in my film camera days, as it gives a great contrast and really dark blacks and bright highlights, and I have been very impressed with the results. There will be plenty more to come over time! This entry was posted on Tuesday, April 5th, 2011 at 18:11. 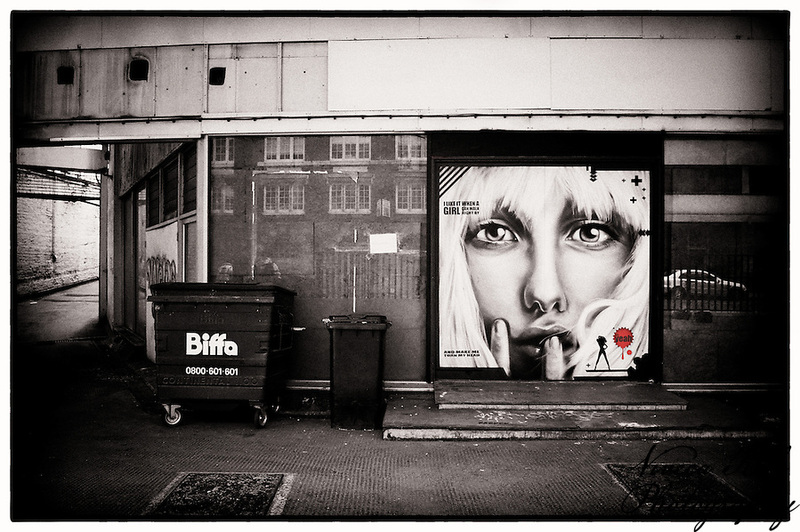 It is filed under Photography, Street Art and tagged with Artist, graffiti, London, Shoreditch, Street Art. You can follow any responses to this entry through the RSS 2.0 feed. Like everyone else I also love the red sign you left in. The is a really great shot for going out of your comfort zone. Love that touch of bright red. Interesting shot! The piece is actually by Trans and Fark… Trans did the girls face and Fark did the graphics around it. Was at Streetfest a couple of years ago. Thanks Fin, will amend accordingly! I see you’re having fun with the selective color feature in Silver Efex 2.0, too. Nice framing and processing. Love the black and white here! Fantastic image! very good – like the reflection of the security dudes in the window. I love the little red dot you left in. Absolutely splendid work!